Picture taken on Dec. 22, 2009 in Conroe, Texas. Yuck. The kids wanted to know when winter would show up. I agreed with them that it doesn’t feel like winter when it is 70 degrees outside. Of course, if we still lived in Nebraska we would be in a blizzard. It’s a toss up as to which one I want right now! 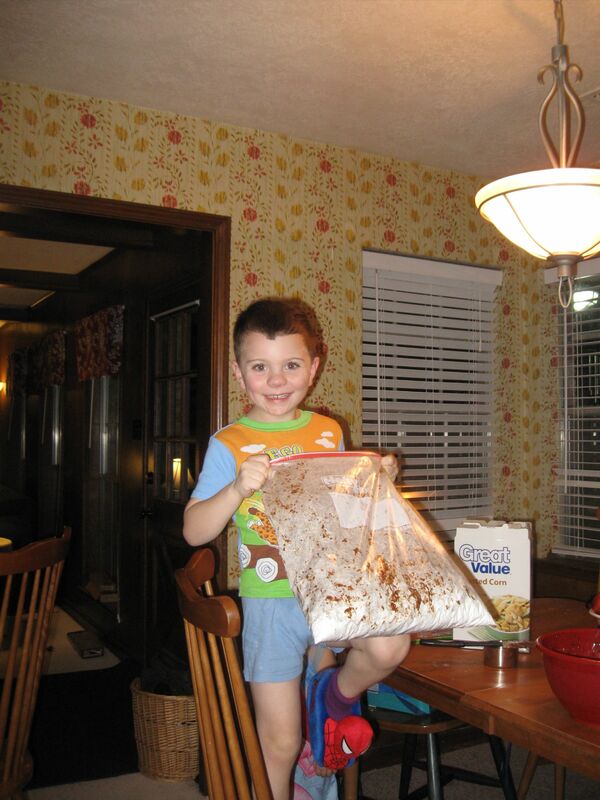 The children and I made puppy chow this year. 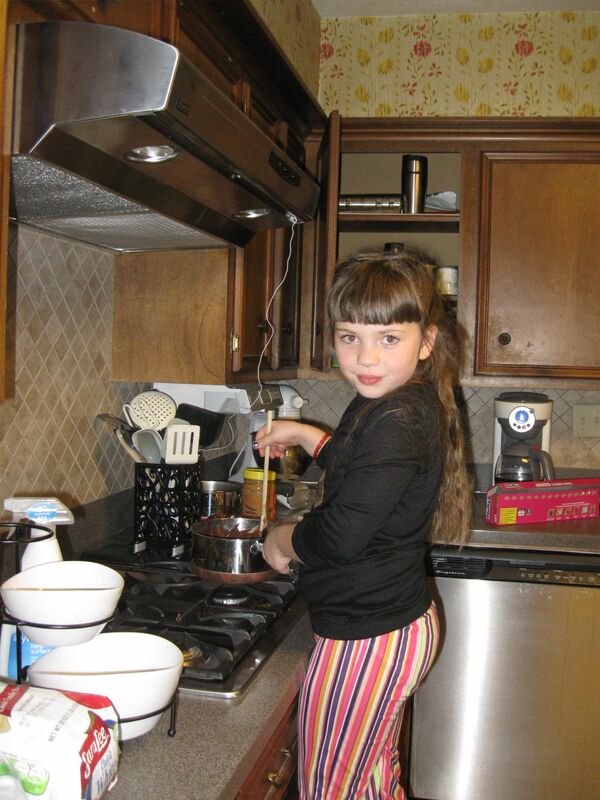 Along with candy and dozens of loaves of banana bread, we were in the kitchen a lot. The kids wanted to help with the puppy chow. Madie stirred the chocolate and peanut butter and Ben did some shaking. Ainsley helped count the ingredients. Ben really got into the shaking. He insisted he could do it better climbed on top of the chair. 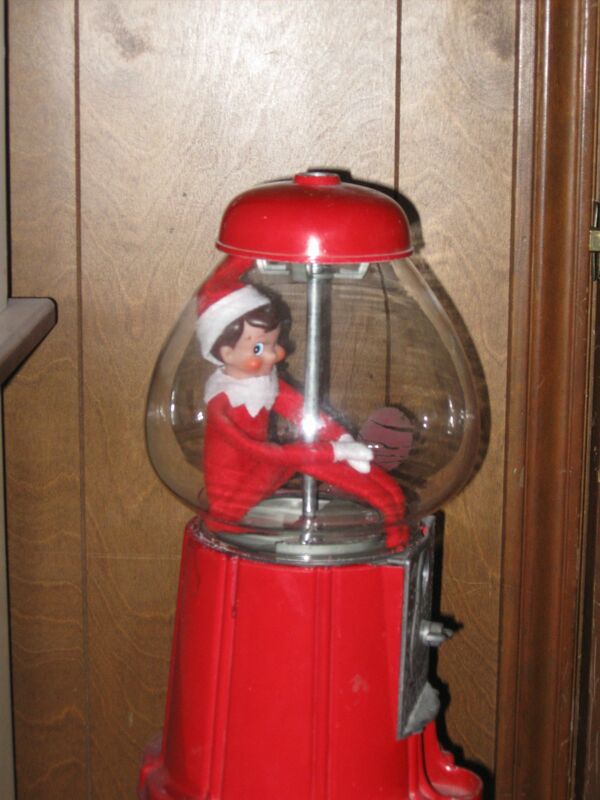 Fuzzy has said goodbye for the year. He will be back again next Thanksgiving. Goodbye, Fuzzy. This was one of his more interesting spots to view us for reporting back to Santa. As a side note to my previous post . . . if you are ever in Geneva there is a hilarious, although terrifying, story about Ben, a gun, and three men at the local funeral home. Trust me that the story is funny. and will probably make you question our parenting skills that we would even allow Ben to have a gun today. But . . . boys will be boys! Ben has a fascination with guns. Chris and I vowed (when the children were babies and we could dream big) that our children would not have play guns in our home. (Since Chris doesn’t come from a hunting family and eventhough I had, it was just easier to say no guns at all.) Then Ben got to about the age of three and everything he touched turned into a gun. Sticks, legos, broom handles, his fingers. There was no avoiding it. So Chris found a double barrel shotgun and we told Ben he could only shoot at vermin (a word that we had to constantly explain in Nebraska) and if he ever pointed the gun at somebody, even in play, we would take the gun away. So now several years later, we have been through at least five guns because he has “loved” on them so much that they have all been destroyed. It has taken me awhile to find another gun (we try to find one that is a double barrel like Daddy uses for trap shooting). This Christmas I happen to have found another one. Ben has played with this $8 toy more than all of the other toys put together. So we ate bear for lunch that day. 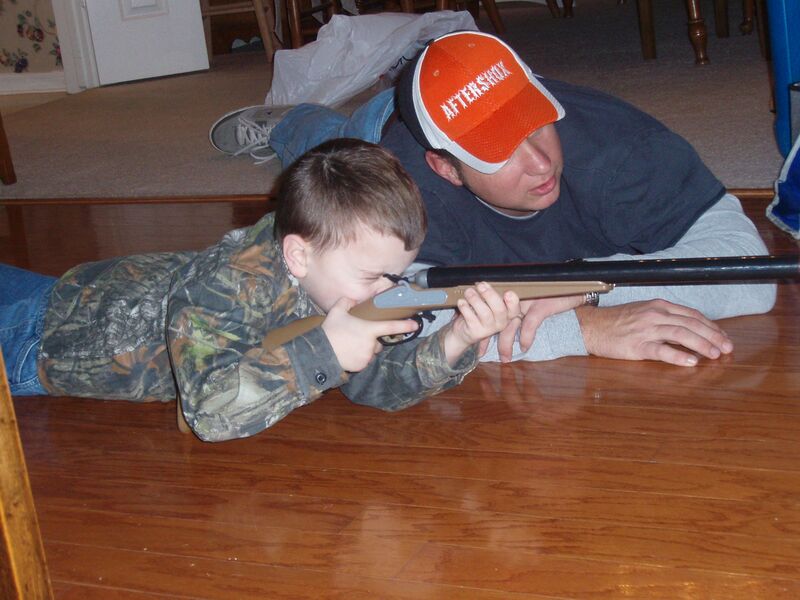 Uncle Will gave Ben some great lessons on hunting. To stay still and to be quiet. And to aim carefully. I only heard about all of this later, but I love this photo of them together. And by the way . . . Ben wore the shirt again today to church! So Ben has worn the shirt for three days straight now! Luckily I pried it off his body tonight before bed and was able to throw it in the wash. My mother pointed out tonight that it wouldn’t be a hunting shirt if he didn’t wear it for a week without washing it. Still . . . Ewww! The kids are asleep. The presents are under the tree. The world is quiet at 3 in the morning. But we had the best time ever tonight and I don’t know how we can top it tomorrow. After coming home from church tonight, we ate dinner and made cookies for Santa. Madie and I decided to check out the Santa Tracker from NORAD. Totally awesome. Ben kept coming and telling me where Santa was. He and Ainsley were really starting to get worried that we would be awake when Santa come. But there were cookies to put out, notes to write to Santa, and reindeer food to place outside. So we worked quickly. Madie already had the tray set up and her note written before we even cleaned up from dinner. They placed the reindeer food outside and Madie decided that the reindeer would also like to have a bowl of water. So she put water outside while keeping an eye on the sky for Rudolph’s nose. Meanwhile, Ainsley is crying because she is worried that Santa will skip our house because she is still up. Ben counted out the carrots for all of reindeer and then we said our prayers and went to bed. NORAD was so cool. The kids kept watch all night to make that Santa wasn’t near Texas. So after the kids were all tucked in, I decided we needed some motivation to fall asleep. So I called NORAD’s hotline for tracking Santa. I put the phone call on speaker phone and when they phone was finally answered the kids went wild. The operator asked if the kids knew where Brazil was because that was where Santa was at the moment. Then the operator said, “Oh my gosh! Santa just took a turn. He’s heading towards Texas right now!!! !” The kids dove for their beds. I was sitting near Ainsley’s bed and she kept telling the operator, “We left you milk and cookies! I love you, Santa. I love you!! !” Kisses. Kisses. It was so sweet. The best phone call we have ever made. Of course, two hours later I hear footsteps upstairs. Ainsley needs to be tucked back into bed. As we are tucking her in, she says, “It takes sooooo long to wait for my Barbie truck from Santa!! !” Poor sweet baby. Morning will come soon enough. And what did we do with our freedom . . . We went to the grocery store!!! Weeeeeee!!!!! We had an awesome time. Ben truly was excited. It had a festive atmosphere. Free goodies. Kind people. Joyous music. All of that together make for happy puddles! We are home now. Making puppy chow as a family and getting ready for worship services tonight. Chris is currently fixing our computer by doing a slow install (the definition of slow is that it takes five days and we are still working on it). So we have internet and some email services but no pictures or prior data yet, so I haven’t been able to post pictures yet. And we have taken plenty. 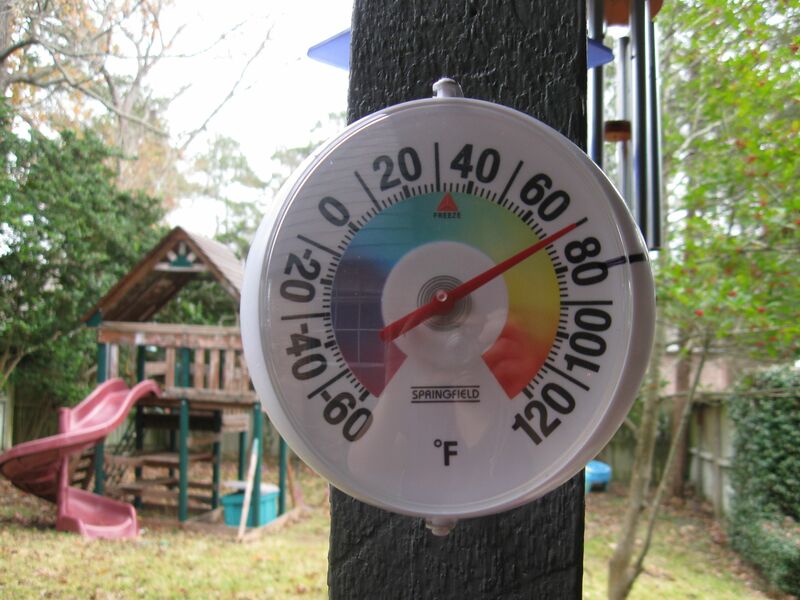 (I especially can’t wait to post a picture of the outdoor thermometer that reads 75 degrees on Dec. 23. It will be awesome to torture my dear Nebraskans. Especially since I heard a lot about the joys of 70 degree weather this Sept./Oct. when it was still 100 degrees here. And no . . . I am not bitter.) He is a little busy right now at work, so my hope is that he gets around to it on the 26th. The man only works once a week and most people think he only works twice a year, so he should have plenty of time after Christmas! We have so much to be thankful for tonight. The list is even too long to mention here. But it can be summed up with three words . . . Ben. Madie. Ainsley. Amen!